This photo is our special needs students working with a group of our general education students to learn how to cook. 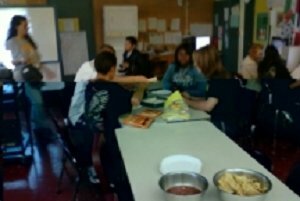 This lesson may be about cooking but it is so much more…it is acceptance, differences, teamwork, hard work, over coming barriers, and so much more. These students come from backgrounds where the just work daily to survive, to get to and from school and to make it out alive. Putting them together to work with students who are learning challenged helps them see how lucky they truly are. Being able to work with both of these groups together and watching a hard street kid work so softly and caring with a student who has limited use of his arms is all I need to know that this program is working.